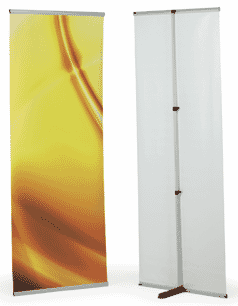 Help your business customers strike hard and fast at their target audience with the versatile Cobra static banner. A simple to use system with top and bottom gripper hangers allows for quick and easy graphic changes in-situ. 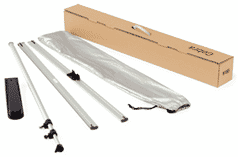 The Telescopic pole allows the system to be set at various heights from 900mm up to 2000mm. Use on a table as a desktop banner for those all-important presentations, right through to the full height, making it a fully versatile advertising tool. Though the examples above are by no means exhaustive, it does give a good indicator of how adaptable the Cobra static banner could be to many different sectors. 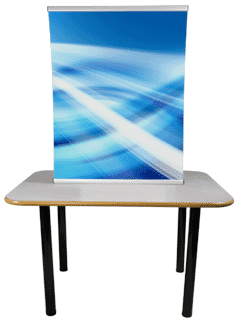 The Cobra static banner can display information or advertisements at various height settings and can be adjusted to suit each individual campaign. Offering a cost-effective way for companies to get their message across with the added bonus of being re-usable. With the Cobra static banner you would be providing your customers an economy banner system with a bite that delivers, whilst making any marketing campaign a force to be reckoned with.